If you're looking for ways to use up a bounty of zucchini from your garden, give stuffed zucchini a try. This dish has so many possibilities. This recipe serves two to four people, but you can easily double it to serve up to eight people. It's a delicious alternative to lasagna or spaghetti when you feel like Italian. Fill a large stock pot 3/4 full of water and bring it to a boil. Rinse off the zucchini and don't trim the ends. Put it in the pot and let it boil until it becomes tender on the outside. Carefully remove it from the water and set it aside on a baking tray lined with parchment until it's cool enough to handle. 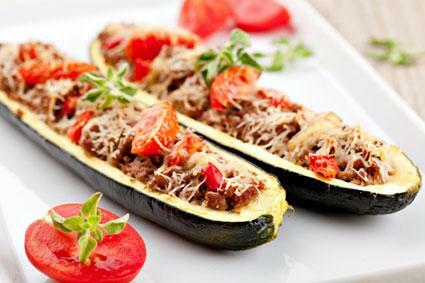 While the zucchini is cooking, combine the ground beef and garlic in a large frying pan and cook until the beef is browned. Drain off the excess fat. Trim the stem end off the zucchini, slice it in half lengthwise and scoop out the center, leaving about a 1/2-inch thick shell to hold the stuffing mix. Add the scooped zucchini to the ground beef mix along with the bread crumbs, spaghetti sauce, cherry tomatoes, and Parmesan cheese. Stir thoroughly to combine. Fill the zucchini halves with the stuffing mix and sprinkle the mozzarella over the top. Bake for approximately 25 minutes or until the cheese begins to bubble. Serve with a nice salad and some Italian bread. Try using 1/2 pound of ground sausage or turkey instead of ground beef. Add 1/4 cup of chopped bell pepper, black olives, and/or onions to the stuffing mix. Instead of spaghetti sauce, try using Alfredo sauce. For a Mediterranean stuffed zucchini, stir together 1/2 pound cooked ground lamb, 1 cup Greek olives (pitted and sliced), 1/2 cup banana pepper rings, 1 cup sliced cherry tomatoes, and 1 cup feta cheese and bake until the feta begins to brown. Combine a total of 2 cups of your favorite chopped veggies and cheese to make a stuffed zucchini side dish. Stuffed zucchini can put a little zing into your weekly lunch or dinner menu, and it gives you a way to use this vegetable aside from making yet another loaf of zucchini bread. Once you've made the recipe above, don't hesitate to try other stuffing variations. You're bound to find a few more favorites that will help keep this dish fresh and exciting.